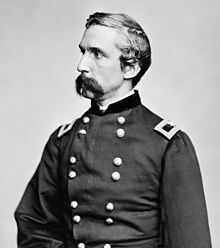 Joshua Lawrence Chamberlain (8 September 1828 – 24 February 1914) was an American college professor from the State of Maine, who volunteered during the American Civil War to join the Union Army. Although having no earlier education in military strategies, he became a highly respected and decorated Union officer, reaching the rank of brigadier general (and brevet major general). For his gallantry at Gettysburg, he was awarded the Medal of Honor. After the war, he entered politics as a Republican and served four one-year terms of office as Governor of Maine. He served on the faculty of, and as president of, his alma mater, Bowdoin College. The enemy seemed to have gathered all their energies for their final assault. We had gotten our thin line into as good a shape as possible, when a strong force emerged from the scrub wood in the valley, as well as I could judge, in two lines in echelon by the right, and, opening a heavy fire, the first line came on as if they meant to sweep everything before them. We opened on them as well as we could with our scanty ammunition snatched from the field. It did not seem possible to withstand another shock like this now coming on. Our loss had been severe. One-half of my left wing had fallen, and a third of my regiment lay just behind us, dead or badly wounded. At this moment my anxietv was increased by a great roar of musketry in my rear, on the farther or northerly slope of Little Round Top, apparently on the flank of the regular brigade, which was in support of Hazlett's battery on the crest behind us. The bullets from this attack struck into my left rear, and I feared that the enemy might have nearly surrounded the Little Round Top, and only a desperate chance was left for us. My ammunition was soon exhausted. My men were firing their last shot and getting ready to "club" their muskets. It was imperative to strike before we were struck by this overwhelming force in a hand-to-hand fight, which we could not probably have withstood or survived. At that crisis, I ordered the bayonet. The word was enough. It ran like fire along the line, from man to man; and rose into a shout, with which they sprang forward upon the enemy, now not 30 yards away. The effect was surprising; many of the enemy's first line threw down their arms and surrendered. An officer fired his pistol at my head with one hand, while he handed me his sword with the other. Holding fast by our right, and swinging forward our left, we made an extended " right wheel," before which the enemy's second line broke and fell back, fighting from tree to tree, many being captured, until we had swept the valley and cleared the front of nearly our entire brigade. My darling wife I am lying mortally wounded the doctors think, but my mind & heart are at peace Christ is my all-sufficient savior. I go to him. God bless & keep & comfort you, precious one. You have been a precious wife to me. To know & love you makes life & death beautiful. Cherish the darlings & give my love to all the dear ones. Do not grieve too much for me. We shall all soon meet Live for the children Give my dearest love to Father, Mother & Sallie & John Oh how happy to feel yourself forgiven God bless you evermore precious precious one Ever yours, Lawrence. The Passing of the Armies: An account of the Army of the Potomac, based upon personal reminiscences of the Fifth Army Corps (1915), "The Last Review"
The momentous meaning of this occasion impressed me deeply. I resolved to mark it by some token of recognition, which could be no other than a salute of arms. Well aware of the responsibility assumed, and of the criticisms that would follow, as the sequel proved, nothing of that kind could move me in the least. The act could be defended, if needful, by the suggestion that such a salute was not to the cause for which the flag of the Confederacy stood, but to its going down before the flag of the Union. My main reason, however, was one for which I sought no authority nor asked forgiveness. Before us in proud humiliation stood the embodiment of manhood: men whom neither toils and sufferings, nor the fact of death, nor disaster, nor hopelessness could bend from their resolve; standing before us now, thin, worn, and famished, but erect, and with eyes looking level into ours, waking memories that bound us together as no other bond;—was not such manhood to be welcomed back into a Union so tested and assured? Instructions had been given; and when the head of each division column comes opposite our group, our bugle sounds the signal and instantly our whole line from right to left, regiment by regiment in succession, gives the soldier's salutation, from the "order arms" to the old "carry"—the marching salute. Gordon at the head of the column, riding with heavy spirit and downcast face, catches the sound of shifting arms, looks up, and, taking the meaning, wheels superbly, making with himself and his horse one uplifted figure, with profound salutation as he drops the point of his sword to the boot toe; then facing to his own command, gives word for his successive brigades to pass us with the same position of the manual, honor answering honor. On our part not a sound of trumpet more, nor roll of drum; not a cheer, nor word nor whisper of vain-glorying, nor motion of man standing again at the order, but an awed stillness rather, and breath-holding, as if it were the passing of the dead! Here, we judge you by what you do, not by who your father was. Here, you can be something. Here, is the place to build a home. But it's not the land. There's always more land. It's the idea that we all have value — you and me. What we're fighting for, in the end, we're fighting for each other. This is a different kind of army. If you look at history you'll see men fight for pay, or women, or some other kind of loot. They fight for land, or because a king makes them, or just because they like killing. But we're here for something new. This has not happened much, in the history of the world: We are an army out to set other men free. America should be free ground. All of it. Not divided by a line between slave state and free, all the way from here to the Pacific Ocean. No man has to bow. No man born to royalty. Here, we judge you by what you do, not by who your father was. Here, you can be something. Here, is the place to build a home. But it's not the land. There's always more land. It's the idea that we all have value — you and me. What we're fighting for, in the end, we're fighting for each other. I haven't known that many freedmen. But those I knew in Bangor, Portland, — you look in the eye — there was a man. There was a "divine spark", as my mother used to call it. That is all there is to it. Races are men. "What a piece of work is man. How infinite in faculties and form, and movement. How express and admirable. In action how like an angel".